Ultimate Assassins is a Mafia themed fighting RPG. Rank against other players with the same goal in mind – to reach the TOP! Become powerful, rich and eliminate other players. In the beginning start doing crimes for some each cash. You have certain money and bullets – but it can all be lost when you get hit by other players – so watch out! The game has a lot of features, some features will be unlocked as you progress through the game. The more you advance, the harder you are to kill, making it easier for you to attack others. Lost Power is a free text-based browser game. The list of crimes includes robbing/stealing, larceny, selling bootleg movies or music, stealing from stores, looking for cash, kidnapping and stealing cars. You can explore the city where you can find travelling agency, jail, various markets, medical center etc. In the gym you can train speed, strength and defense to commit crimes successfully and fight against enemies. The game allows you to find a job and participate in different courses. Interested? Visit Lost Power website! 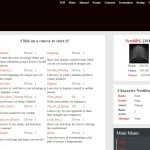 Zombies RPG is a text-based browser game where you must survive in the zombie world. The first step would be building a camp. Afterwards you can explore the map to find resources. Forming a group allows you to fight the zombies with other players, so you don’t need to be alone. A ladder section gives you a short review of the best players and you can also take a look at your own position in the ranking. Accept quests, read their short descriptions and complete tasks. Interested? 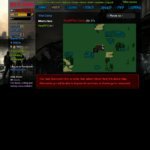 Visit Zombies RPG website! Fate and Fortune is a web-based roleplaying game. Attack enemies in the arena without choosing your opponents. Use the basic attacking or special spells. Losing the fight means that you also lose experience and gold. In melton’s magic and general store you can purchase or sell items. Increase stats such as speed, physical defense, luck, magic attack, accuracy, physical attack, and so on. Learn new skills – some of them will unlock as you progress. Your spells are mentioned in a spellbook where you can manage spells. 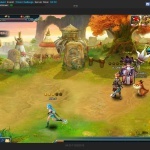 Dark Fusion is an online RPG where your main aim is to attack others and reach the top. Before fighting against opponents you must increase your stats in the gym. To have even more successful winning chance you can also take various courses that increase your strength, IQ and labour. Visit real estate where you can purchase a house, villa, mansion or palace. Earn money by gambling in casino or buying a hotel that gives you daily profit. Interested? Visit Dark Fusion website! Kinslayer is a browser-based text game with wonderful adventures. You can choose your race between trolloc and human. Class selection includes ranger, thief, warrior and channeler. Warriors have an ability to practise weapon skills and ranger class is a very versatile class. Thieves are quite sneaky throughout the game and channelers are very powerful. You can equip weapons and armor that you’ve collected from quests, mining, shops and many other locations. Corrupted Streets is a free text-based browser game. Inventory gives you a clue what items or weapons you’ve equipped. Crimes have been categorized into three groups and the list of crimes includes shoplifting, mugging, kidnapping, credit card fraud etc. Training in the gym contains four different stats so you could train your strength, defense, dexterity and sweat. Take courses at school, get a job, gain experience and prepare yourself for tough street life. Interested? Visit Corrupted Streets website! 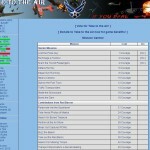 Take to the Air is a text-based browser game with amazing air combat. In the game you can find a huge list of different missions. This action decreases your courage bar, but with each mission you gain experience. Attend flight school, participate in various courses and acquire new skills. Collect enough money to be able to create your own squadron. Sometimes you should take a look at the newspaper to be aware of the current situation in the game. Interested? Visit Take to the Air website! 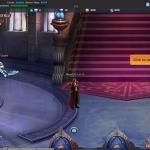 Myths and Mortals is an online fighting RPG. There’s a labyrinth for you to explore where you can meet extraordinary creatures or find items. You have also been given an opportunity to explore underworld that is a mystical place. In most browser games you can commit crimes, but in Myths and Mortals you can do good deeds to move to the good side. The game also allows you to activate spells, train stats, attack your targets and become a hero. Interested? 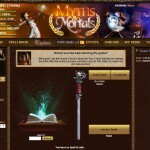 Visit Myths and Mortals website! Dragon Pals is a browser-based game with a modern looking graphics. Dragon Pals is all about having adventures and fighting against monsters. You can choose your character and go on a journey with a companion. This means that you can have a princess and a small pet with you. Talk to the princess and read carefully her answers. Your pet can be a huge help for you in battles as he can cause damage to the enemy. Level up, explore different locations and follow the story. Interested? Visit Dragon Pals website! 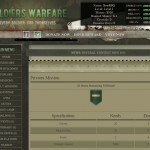 Soldiers Warfare is a free browser-based online roleplaying game. Enter the gym if you want to train strength, guard and agility. Complete various missions with each having different mission requirements. After completing a daily mission, you will get crystals, experience and money as a reward. Explore the city by visiting markets, gambling in casino, travelling to other locations, going shopping etc. You might also want to open your bank account or take bank loans. Interested? Visit Soldiers Warfare website! In Will of the Ninja you can experience the real fighting. It’s a free to play browser game with lots of great features. While creating your character, you can decide in which village you would like to start your journey. Later you could take a look at the other players who are members of the same village. For more successful fighting, you ought to train your stats, train jutsu and equip the best equipment. Make fast decisions, use your strategic mind and reach the top. Interested? Visit Will of the Ninja website! 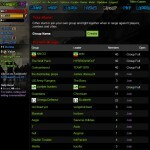 HeroWarZone is an online war fighting game. Visit the Iregha’s Market Stall to purchase body armor, long sword, templar knight helmet and other equipment items. Use everyday turns at searching Downtown to find cash and items. You could buy skills such as basic healing, halo strobe, minor distraction and more. Gamble in casino, join a drag race, get a job, train stats and create a crew. Buy a pet to gain stats bonuses such as extra speed, strength or defense. You have to spend points to start a mission. Each mission includes various objectives and you will have 24 hours to complete all the objectives. Successfully completed missions give you stat boosts, experience, money, points or items. Game of Win is a free text-based browser game. General Store includes weapons, items and armour that you can purchase to yourself. Market also includes variety of jewelry. You can take a look at your mail by visiting the Post Office and Guild Hall allows you to create a guild. Train your stats like strength/endurance/agility/constitution and go to the arena to choose your target you would like to hunt. Deposit or withdraw your money and visit hospital when needed. You can also buy tokens in exchange for real money. Interested? Visit Game of Win website! 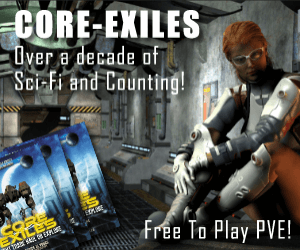 Nova Genesis is a free to play browser game with a high quality. At first, you have to decide your character between wraith, psyon and corsair. You can easily find some quests that you must accept and complete. There are lots of other characters that are all involved in the game. You should read their stories and follow them. After you have completed the tasks, you can gain experience. During the ruthless fight, you can use your special skills, so you could be the winner. Interested? Visit Nova Genesis website! Mechanical Wars is a role-playing game set in the apocalyptic world. Mechanical Wars gives you an idea of a real fighting. While being in jail, you can still explore the surroundings and visit various places. In jail you can also train your stats in the jail gym which means that you have lots of activities even in jail. Search the streets to find cash or crystals. After collecting crystals, you can spend them on IQ, money or energy refill. Interested? Visit Mechanical Wars website! Route to Destiny is a free role-playing game set in the future. At first, there are six different creatures available and you can select a character you would like to buy. Complete quests to have adventures and wander around the world. Under a battle section you can keep an eye on your incoming battles, so you wouldn’t miss the fights. While creating a new squad, you have to think about the name and the leader. In addition, you get to choose whether your squad is defensive or aggressive. Interested? Visit Route to Destiny website! 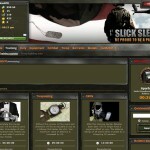 SlickSleeve is a free text-based browser game about US Army that gives you a possibility to become a general. Training contains basic training, special training and troop training. There are also special training courses available that teach you new abilities. To earn money you can be on duty which basically means getting a job. Peek in an inventory section to see what clothes and weapons you’ve equipped. Attack your enemies, join a troop, win medals as a reward and become the best general of all time. 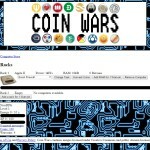 Coin Wars is a text-based browser game with awesome activities. You should definitely try out spinning feature that gives you a certain amount of free spins. Spin the wheel and win great prizes like warcoins and bitcoins. Obviously you should also acquire new skills, so do not hesitate and train firewall skill and hacking skill. If you are broke and need some money immediately, you could take an odd job which requires energy, but pays you little money. Interested? Visit Coin Wars website! Rise of Zombies is a fighting MMO where you must defend yourself and stay alive. Waves of zombies will hit every day to destroy every camp, so make sure to prepare yourself before the next zombie wave. Leader area is a place to equip items and use skill points. You may obtain skill points by training or leveling up. Exploring is the best way to obtain survivors and scavenging is useful to find resources. Start or join a group to be more protected and get supplied with essential items. Complete tasks, battle against others and climb up the ladder. Interested? Visit Rise of Zombies website! 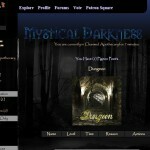 Mystical Darkness is a fantasy text-based browser game. Gems have been divided into three groups and under Gems section you can always keep your eye on your gemstones. Training area contains strength, guard, agility and labour. Wander in the forest where you can find precious items, you can be attacked and acquire new skills. You could get a job such as hunter, guardsman or blacksmith. Hall of Legends includes all the best players. Join/create a clan and purchase yourself a house. Interested? Visit Mystical Darkness website!